This month Toyota celebrates ten years at its San Antonio, Texas assembly and production center. On October 17, 2003, Toyota broke ground on a two thousand acre site that would become the new production plant for the midsize Tacoma and full size Tundra pickup trucks. Over two million square feet in size, the facility was originally meant to be an assembly center only, but it quickly grew into a production facility as well. It builds approximately two hundred thousand trucks a year and directly employs just fewer than three thousand workers. In September of 2013, the San Antonio plant produced its one millionth truck, which was a 2014 Toyota Tundra. 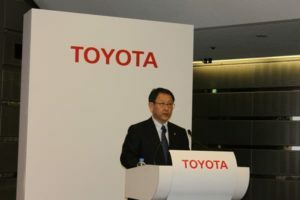 The plant was a two billion dollar investment for Toyota, and it has proven well worth it despite a few stumbling blocks over the years. The plant has had its share of obstacles along the way, but it has managed to overcome all of them. Shortly after the production of its first truck, a safety recall threatened the Toyota name. In 2011, an earthquake and tsunami struck Japan and cut off the plant’s main supply source. An economic decline in 2008 slowed sales, which in turn resulted in a lower production rate for the production facility. These troubles were highlighted at the anniversary celebration, as were the successes of the plant. To celebrate its recent anniversary, Toyota has launched a program called the Ten For Ten. They are donating ten trucks to ten different local non profit organizations and institutions. The trucks will be a combination of the Tundra and Tacoma models, and they are being offered as a show of gratitude to the San Antonio community for the support over the last ten years. Some charity organizations such as Habitat for Humanity and Christian Senior Services Meals on Wheels as well as the San Antonio Fire Department, Independent School District and local colleges will receive one of the donated vehicles. Acknowledging the trust and faith the community has placed in Toyota will help form an even stronger bond between the city and the plant. State and local officials helped convince Toyota to choose San Antonio for their plant site and are grateful for the economic boost it has provided over the past ten years. They are looking forward to another decade that hopefully will be filled with fewer obstacles and more milestones.